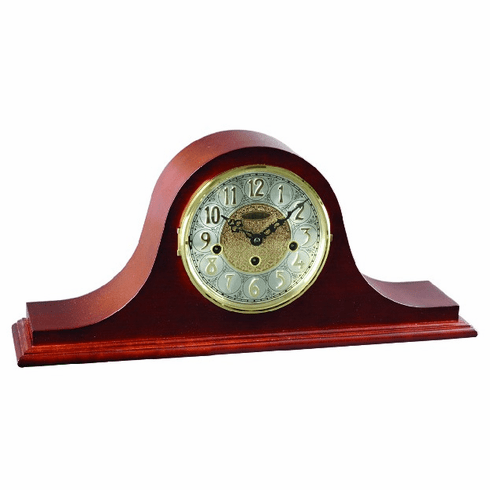 Traditionally styled tambour clock in an elegant cherry finish. The dial features a diamond turned chapter ring with embossed Arabic numerals and a beautiful embossed center. The hands are metal serpentine behind a brass bezel with convex glass lens. Brass 8-day key-wound movement plays 4/4 Westminster chimes. Shut-off through the dial. Dimensions (inches): H: 8-7/8", W: 19-3/4", D: 4-3/8"